Why Is My Chest Sore Post-Workout? If you did one too many bench presses, you might be feeling it in your chest muscles the next day. 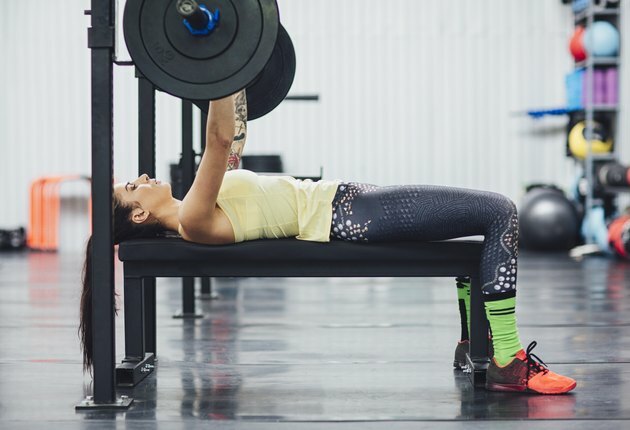 If your chest is sore after a workout, it is likely a result of your muscles reacting to the stress of the exercise, and there are multiple reasons it can occur. You might have worked a little too hard after taking a break from strength training or perhaps ramped up the amount of weight too much. The sore muscle, however, can be soothed — just take precautions the next time you hoist the barbell. Sore muscles are common after a hard workout. If you've done a lot of pushups, bench presses or other similar movements, your chest will likely be sore after your workout. Although chest muscle soreness is common with exercise, chest pain after a workout is not normal. If you have pain in your chest that makes it difficult to breathe or does not change with the movement of your arms, seek immediate medical attention. This can be a sign of a life-threatening condition such as a heart attack. Symptoms of a heart attack can also include sweating, nausea, dizziness, pressure or tightness in your jaw, neck or arm and fatigue, according to Mayo Clinic. Because several of these symptoms also occur with working out, it's better to be safe than sorry. When you work a muscle too hard, you'll feel a familiar soreness within a few hours that can last up to two days. Known as delayed-onset muscle soreness, or DOMS, this chest muscle soreness after workout often represents the tearing down of muscle tissue. It will hurt to move, to touch and may perhaps even swell a bit. In some cases, it might not even be the actual muscle that's hurting. If a tendon that connects the muscle to the bone gets overworked, it can become irritated and then inflamed. Again, this can cause pain and swelling. If you have chest muscle soreness after exercise, the best remedy is to cut back on the weights. The length of time you should rest depends on how bad the pain is — avoid doing any exercise that hurts. You can, however, still do any exercise that doesn't cause pain to the sore muscles. If possible, keep the joint moving occasionally to avoid stiffness, which can affect the range of motion. You can also ice the chest muscles that hurt, applying the ice for 20 minutes at a time. Additionally, you can take an over-the-counter pain reliever or anti-inflammatory to reduce the soreness. In rare cases, a sore muscle might need the healing touch of a medical professional. If your chest muscles hurt for more than a couple of days after exercise and continue to affect your athletic performance, make an appointment with your doctor. Additionally, if the sore muscles wake you from sleep or the soreness continues to increase or requires increasing amounts of pain medication, these are indicators that you might have done damage to the muscle or tendons. Stretch the muscles, which promotes mobility and helps you recover faster. Consume protein after working out to help muscle repair. Immediately ice the muscle, even if it's not in pain yet — this will stop inflammation from occurring. Do Chest and Triceps Need to Be Worked Out on the Same Day?